The exciting thing about this crochet technique is – it creates a truly reversible fabric. Single designs have the same pattern on both sides; double designs have a different design and a different dominant color on each side. And since the fabric is reversible, you basically create two items at the same time. Just turn your purse inside out or reverse a bedspread/rug combo and you have a new look. Easy to Learn – Use basic crochet stitches – chain stitch, single crochet, half double crochet and double crochet – to create beautiful patterns. 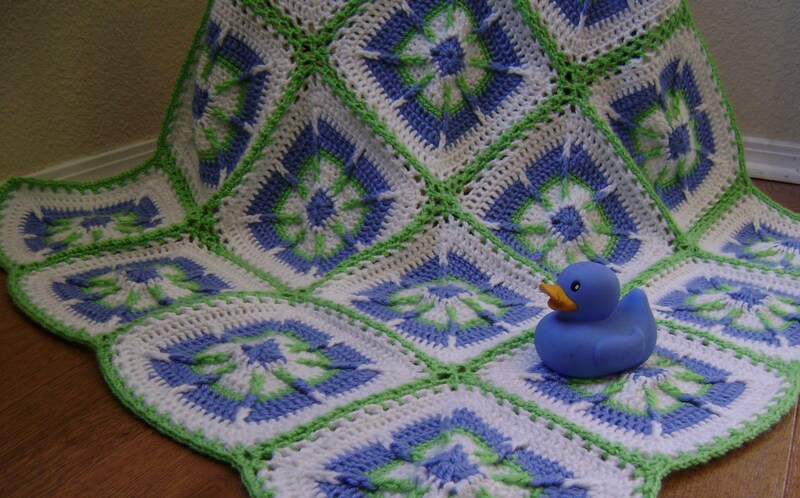 The Hanover Baby Blanket is found on page 90 of Crochet! Spring 2016. Work Tunisian crochet in columns turning this unisex baby blanket on its end. Use the waffle stitch to create a zigzag pattern. Then connect as many columns as you want to make this baby blanket or keep adding them to create an afghan. The best thing is – the entire project is add as you go so no sewing is involved. A great project for using your yarn stash. The Butterfly Nest Scarf is found on page 12 of Crochet Spring 2016. Repetition of simple stitches interspersed with spectacular Solomon’s knots make this scarf a “must-make”. Uptown Girl Leg Warmers are found on page 22 of the Crochet! October 2015 special edition, From Scraps to Sensational. With small amounts of worsted-weight yarn, you can add some fun and color to your wardrobe with these cozy, textured warmers. There are numerous other projects that let you turn small amounts of yarn into creative works of art for your home and wardrobe! Quick & Simple – Crochet for the Home, 10 Designs from Up-and-Coming Designers! My Boy’s Granny Square Baby Blanket is found on page 8. With its eye-catching starry center created by Front Post stitches, this cheerful granny square baby blanket will brighten any boy’s room. Crochet it for your own baby or as shower gift. Either way, it will become a treasured reminder of your thoughtfulness and love. Available at Amazon.com. 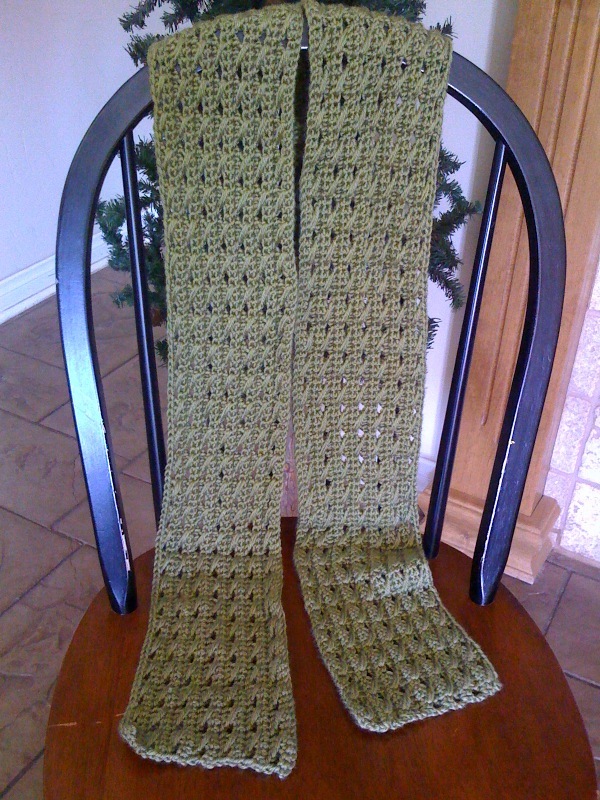 Quick & Simple – Crochet Scarves, 9 Designs from Up-and-Coming Designers! DC with a Twist Scarf is found on page 5. This elegant yet easy-to-crochet scarf consists of one row of single crochets and one row of double crochets with a twist. It creates a lovely pattern that appears much more difficult than it really is. Make it in a comfy yarn such as Red Heart Soft Yarn for everyday use, or chose a shiny, novelty yarn for evening wear. Either way, it’s the perfect scarf for any occasion! Available at Amazon.com. Laura Zander created Knit Red and Sew Red as part of her Stitch Red campaign in support of The Heart Truth® which brings awareness to heart health. It’s now crochet’s turn. In Crochet Red, more than thirty crochet celebrities have come together to help raise awareness of the number-one killer of women in the United States. The skill requirements range from easy to experienced. There are no beginning projects. I’m proud to say my design – Gingham Afghan, a bit of Scottish elegance for your home – can be found on page 34. 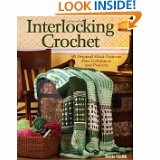 Pick up a hook and start crocheting one of these fabulous items for your home or yourself. I’m happy to announce that my Irish Blossoms Baby Blanket is found on page 30 of the February 2015 Crochet World magazine. This scrap-yarn granny square blanket is reversible. One side of each square creates a motif that resembles an Irish crochet flower, and the other side looks like a two-color baby block. The magazine is available in your local craft shop or go to www.crochet-world.com for the online version. If you haven’t seen it yet, I’m happy to announce that my Dottie Tote design is in the February/March 2014 Crochet Today! Magazine, Mad for Mod, page 65. Black and white is all the rage so wear it well in a tote with fabric yarn ruffles. This polka-dot fabric yarn certainly adds personality to an everyday tote. It’s available now in a magazine or crafts store near you. Or go to http://www.crochettoday.com and look for the February/March 2014 issue. If you haven’t seen it yet, I’m happy to announce that my Watermelon Parfait Baby Blanket design is in the Summer 2013 Crochet! Magazine, page 56. This cheery blanket with its fresh watermelon colors will brighten any nursery and would make a beautiful gift for a new mom-to-be. It’s available now in a magazine or crafts store near you. Or go to http://www.crochetmagazine.com and look for the Summer 2013 issue. Knit & Crochet Now – Season 5 I’m happy to announce that my design of Blueberry Parfait Afghan is included in Season 5, Episode 501. Visit www.KnitAndCrochetNow.com to see the pattern and check your local TV schedule for when the episode will be shown. Knit & Crochet Now – Season 5 I’m happy to announce my pattern Reversible Interlocking Crochet Placemat is included in Season 5, Episode 507.